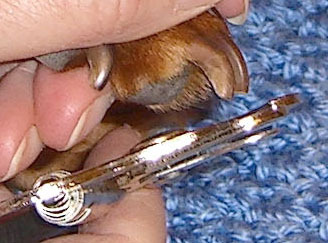 Today Mommy trimmed some of my little Dachshund nails. I don’t really like getting my nails trimmed, so she only cuts a few at a time. She says it is a part of grooming. Then she brushed my little Dachshund teeth. This is also part of what she calls grooming. This mini dachshund doesn’t really like getting that done either. She told me that we all have to get our teeth brushed for the same reasons. If we don’t have our teeth brushed something she called tartar and plaque build up and will cause your cavities and tooth decay. If your teeth gets cavities, then they will start to hurt, especially when you are eating. If it gets bad enough, the vet might have to pull the bad teeth right out of your mouth! Well, I know I don’t want my teeth pulled out so I’ll let Mommy brush my Dachshund teeth! She also said that if she doesn’t trim my nails, they will keep growing longer and longer and will start to hurt my paws when I walk if they get too long. I didn’t know that. Well, I don’t want any pain or discomfort. Sampson you are so cute. Wish you could meet Bella my pretty little girl. You and Bella would have so much fun!